From the early days of European expansion into the Great Lakes region, the batteau was an essential part of the transportation system. This flat-bottomed boat was a common sight on the lakes and rivers of the wilderness, yet little has been written about it. 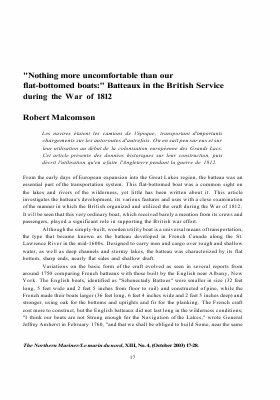 This article investigates the batteau's development, its various features and uses with a close examination ofthe manner in which the British organized and utilized the craft during the War of 1812. It will be seen that this very ordinary boat, which received barely a mention from its crews and passengers, played a significant role in supporting the British war effort. The Northern Mariner/Le marin du nord, XIII, No. 4, (October 2003) 17-28.